Miklós Boskovits (1935–2011), “Byzantine 13th Century/Madonna and Child on a Curved Throne/c. 1260/1280,” Italian Paintings of the Thirteenth and Fourteenth Centuries, NGA Online Editions, https://purl.org/nga/collection/artobject/35 (accessed April 19, 2019). This painting and the Enthroned Madonna and Child are the oldest paintings on the National Gallery of Art’s walls. They may have been created by the same anonymous artist in Constantinople (now Istanbul, Turkey), then the capital of the Byzantine Empire. Panels such as these were highly influential in the development of Italian painting. They stand at the very beginning of the history of panel painting in Italy. Painting on wooden panel had not been common in medieval Europe as church decorations were mostly on the walls themselves, in fresco or mosaic. Painting on canvas came even later. Around the 13th century, however, a confluence of events profoundly affected painting in Italy. Focus shifted to a new kind of freestanding imagery: the painted altarpiece. Italy experienced an influx of painted wood panels—and panel painters—from the Byzantine Empire. Following the Fourth Crusade in 1204, many icons (paintings of a sacred personage used as an object of veneration) were brought to Italy from Byzantine sanctuaries in Greece. Byzantine icon painters also left Greece to work in Italy, bringing their techniques and styles with them. We can see the abstracted style of Byzantine icons here. The gold striations that define folds in clothing, the round volume of Mary’s veiled head, and the frontal pose of Jesus—who looks more like a miniature adult than a child—are all part of the Byzantine tradition. Because their subject is not the temporary appearance of the physical world but a holy and infinite presence, icons avoid direct references to earthly reality and to specific times or places. Instead, their backgrounds are dematerialized with shimmering gold, and figures appear timeless and unchanging. Cf. D. I. Pallas, “Himmel­smächte, Erzengel und Engel,” in Reallexikon zur byzantinischen Kunst, ed. Klaus Wessel, 7 vols. (Stuttgart, 1978), 3:26 – ​32, 35– ​40. Aligning himself with those who considered the Mellon and Kahn Madonnas as the works of two different hands (see also notes 16, 17, and 24), Jaroslav Folda (1995) argued that the Kahn Madonna was painted by a Greek painter of Constantinople, whereas its companion panel dated, in his view, “somewhat later” and was executed in an “as yet undetermined Levantine location.” See Jaroslav Folda, “The Kahn and Mellon Madonnas: Icon or Altarpiece?” in Byzantine East, Latin West: Art-­Historical Studies in Honor of Kurt Weitzmann, ed. Doula Mouriki (Prince­ton, 1995), 501 – ​506. Returning to the question later (1997, 2001, 2002, 2005), Folda specified Cyprus as the most probable location for the execution of the Mellon Madonna, though not excluding other possible candidates (Frankish Greece, Crusader states). For her part Rebecca Corrie, having pointed out the Byzantine origin of the types of throne present in the two versions of the Madonna in the National Gallery of Art (1985), later came to the conclusion (1996, 2000, 2005) that “the two Washington panels fit well into Byzantine paintings” and that they were probably the work of “artists trained at Constantinople or Thessaloniki.” Jaroslav Folda, in The Glory of Byzantium: Art and Culture of the Middle Byzantine Era, A.D. 843 – ​1261, ed. Helen C. Evans and William D. Wixom (New York, 1997), 391, 396 – ​397; Jaroslav Folda, “Reflections on the Mellon Madonna as a Work of Crusader Art,” in Dei gesta per Francos: Études sur les croisades dédiées à Jean Richard / Crusade Studies in Honour of Jean Richard, ed. Michel Balad, Benjamin Kedar, and Jonathan Riley-­Smith (Aldershot and Burlington, VT, 2001), 361 – ​371; Jaroslav Folda, “Icon to Altarpiece in the Frankish East: Images of the Virgin and Child Enthroned,” in Italian Panel Painting of the Duecento and Trecento, ed. Victor M. Schmidt, Studies in the History of Art (Washington, DC, and New Haven, 2002), 127 – ​129, 131 – ​135, 139; Jaroslav Folda, Crusader Art in the Holy Land: From the Third Crusade to the Fall of Acre, 1187 – ​1291 (Cambridge, 2005), 457 – ​458, 557; Rebecca W. Corrie, “Tuscan Madonnas and Byzantine Masters,” in Abstracts and Program Statements for Art History Sessions: Seventy-­Third Annual Meeting, College Art Association of America, February 14 – ​16, 1985, Los Angeles (Los Angeles, 1985), 46; Rebecca W. Corrie, “The Perugia Triptych and the Transmission of Byzantine Maniera Greca,” in Acts: XVIIIth International Congress of Byzantine Studies, vol. 3, Art History, Architecture, Music, ed. 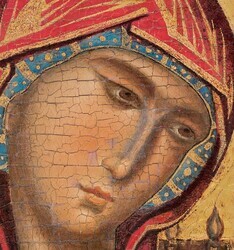 Ihor Ševčenko, Gennady G. Litavrin, and Walter K. Hanak (Moscow, 1996), 41; Rebecca Corrie, in The Mother of God: Representations of the Virgin in Byzantine Art, ed. Maria Vassilaki (Milan and London, 2000), 438 – ​439; Rebecca W. Corrie, “The Kahn and Mellon Madonnas and Their Place in the History of the Virgin and Child Enthroned,” in Images of the Mother of God: Perceptions of the Theotokos in Byzantium, ed. Maria Vassilaki (Aldershot and Burlington, VT, 2005), 293 – ​300. Cf. Luciano Bellosi, Cimabue, ed. Giovanna Ragionieri (Milan, 1998), 58 – ​59, and Rebecca W. Corrie, “The Kahn and Mellon Madonnas and Their Place in the History of the Virgin and Child Enthroned,” in Images of the Mother of God: Perceptions of the Theotokos in Byzantium, ed. Maria Vassilaki (Aldershot and Burlington, VT, 2005), 299, who considered the two paintings as having come “from the same workshop” and “realized at about the same time,” but not by the same artist. We do not have at our disposal sufficient data to determine whether, and to what degree, the technique of a painter of this period could alter in the course of years or decades. While we may freely admit that there are some technical differences in the execution of the two Madonnas in the Gallery, we cannot infer from this that they are the work of different hands. Still less can any such conviction dispense us from a careful stylistic analysis of the two images. Reflecting on the different functions of the two Madonnas in the National Gallery of Art, Jaroslav Folda (1995) conjectured that the Kahn Madonna was intended as a large processional icon, whereas the other panel might have been “one wing of a large diptych for private or public use.” Folda also confirmed these hypotheses in later contributions, specifying (2002) that the Kahn Madonna “can be easily understood as a large processional icon that could have been placed on a proskynetarion or positioned behind an altar in a Latin church.” Victor M. Schmidt (1996) accepted this proposal, though he did not exclude that the Mellon Madonna might originally have been a self-standing icon. According to Rebecca Corrie (2005), “a panel such as the Mellon Madonna might have been made for private devotion, or even as part of an iconostasis perhaps,” while the Kahn Madonna, in view of its considerable size, “could have functioned in a pair of despotic icons.” Jaroslav Folda, “The Kahn and Mellon Madonnas: Icon or Altarpiece?” in Byzantine East, Latin West: Art-­Historical Studies in Honor of Kurt Weitzmann, ed. Doula Mouriki (Princeton, 1995), 505 – ​506; Jaroslav Folda, “Icon to Altarpiece in the Frankish East: Images of the Virgin and Child Enthroned,” in Italian Panel Painting of the Duecento and Trecento, ed. Victor M. Schmidt, Studies in the History of Art (Washington, DC, and New Haven, 2002), 127 – ​128; Victor M. Schmidt, “Die Funktionen der Tafelbilder mit der thronenden Madonna in der Malerei des Duecento,” Mededelingen van het Nederlands Instituut te Rome 55 (1996): 60 – ​63; Rebecca W. Corrie, “The Kahn and Mellon Madonnas and Their Place in the History of the Virgin and Child Enthroned,” in Images of the Mother of God: Perceptions of the Theotokos in Byzantium, ed. Maria Vassilaki (Aldershot and Burlington, VT, 2005), 295. Following Fry 1931 and D’Ancona 1935, the proposition that the two Madonnas might have been produced in the same workshop was explicitly denied by Belting 1982, 1990; Hoenigswald 1982; Folda 1987, 1995, 1997, 2002, 2005; Polzer 1999, 2002; and Kirsch and Levenson 2000. See Roger Fry, “Mr Berenson on Medieval Painting,” The Burlington Magazine for Connoisseurs 58, no. 338 (1931): 245; Paolo D’Ancona, Les primitifs italiens du XIe au XIIIe siècle (Paris, 1935), 46 – ​47; Hans Belting, “The ‘Byzantine’ Madonnas: New Facts about Their Italian Origin and Some Observations on Duccio,” Studies in the History of Art 12 (1982): 7 – ​22; Hans Belting, Bild und Kult: Eine Geschichte des Bildes vor dem Zeitalter der Kunst (Munich, 1990), 33, 417, 420; Ann Hoenigswald, “The ‘Byzantine’ Madonnas: Technical Investigation,” Studies in the History of Art 12 (1982): 25 – ​31; Jaroslav Folda, “The Kahn and Mellon Madonnas: Icons or Altarpieces?” Center / National Gallery of Art, Center for Advanced Study in the Visual Arts 7 (1987): 57 – ​58; Jaroslav Folda, “The Kahn and Mellon Madonnas: Icon or Altarpiece?” in Byzantine East, Latin West: Art-­Historical Studies in Honor of Kurt Weitzmann, ed. Doula Mouriki (Princeton, 1995), 501 – ​510; Jaroslav Folda, in The Glory of Byzantium: Art and Culture of the Middle Byzantine Era, A.D. 843 – ​1261, ed. Helen C. Evans and William D. Wixom (New York, 1997), 391, 396 – ​397; Jaroslav Folda, “Icon to Altarpiece in the Frankish East: Images of the Virgin and Child Enthroned,” in Italian Panel Painting of the Duecento and Trecento, ed. Victor M. Schmidt, Studies in the History of Art (Washington, DC, and New Haven, 2002), 123 – ​145; Jaroslav Folda, Crusader Art in the Holy Land: From the Third Crusade to the Fall of Acre, 1187 – ​1291 (Cambridge, 2005), 457 – ​458, 557; Joseph Polzer, “Some Byzantine and Byzantinising Madonnas Painted during the Later Middle Ages, 1,” Arte cristiana 87 (1999): 85; Joseph Polzer, “Some Byzantine and Byzantinising Madonnas Painted during the Later Middle Ages, 2,” Arte cristiana 87 (1999): 167 – ​182; Joseph Polzer, “The ‘Byzantine’ Kahn and Mellon Madonnas: Concerning their Chronology, Place of Origin, and Method of Analysis,” Arte cristiana 90 (2002): 401 – ​410; Andrea Kirsh and Rustin S. Levenson, Seeing through Paintings: Physical Examination in Art Historical Studies (New Haven and London, 2000), 180. It should further be recalled that Viktor Lazarev (1933, 1947, 1959 – ​1960, 1967) consistently spoke of two masters as the authors of the Kahn and Hamilton (Mellon) Madonnas, though he recognized that their figurative culture had a common source. See Viktor Nikitič Lazarev, “Early Italo-­Byzantine Painting in Sicily,” The Burlington Magazine for Connoisseurs 63 (1933): 283 – ​284; Viktor Nikitič Lazarev, Istorija vizantijskoj živopisi: V druch tomach (Moscow, 1947 – ​1948), 192, 351 n. 116; Viktor Nikitič Lazarev, “Constantinopoli e le scuole nazionali alla luce di nuove scoperte,” Arte veneta 13 – ​14 (1959 – ​1960): 11 – ​13; Viktor Nikitič Lazarev, Storia della pittura bizantina (Turin, 1967), 318 – ​319, 347 n. 117. See note 25 above. It seems plausible to suggest a similar origin for the Kahn and Mellon Madonnas, though these are distinguished from the icon in Bari by the particular accomplishment of their execution and by their stylistic kinship with works having at least a probable Constantinopolitan origin. In conclusion, therefore, while admitting that the origin of these paintings will probably long remain a bone of contention, the present state of our knowledge suggests that they were produced in a workshop culturally bound to Constantinople in years not long before or not long after 1261, the presumed date of the image they most closely resemble, the mosaic in Hagia Sophia. Said to have come from a church, or convent, in Calahorra (province of La Rioja, Spain). Gabriel Dereppes, Madrid; purchased 11 September 1919 by (Duveen Brothers, Inc., London, New York, and Paris); Carl W. Hamilton [1886-1967], New York, early 1920s; (Duveen Brothers, Inc., London, New York, and Paris); sold 15 December 1936 to The Andrew W. Mellon Educational and Charitable Trust, Pittsburgh; gift 1937 to NGA. The provenance from Calahorra, reported for the first time by Bernard Berenson (“Due dipinti del decimo secondo secolo venuti da Costantinopoli,” Dedalo 2 (1921): 284-304), and then repeated in the subsequent literature, has sometimes been doubted, but, according to NGA systematic catalogue author Miklòs Boskovits, not on any good grounds. (See also the provenance for NGA 1949.7.1.) Writing from Madrid, Dereppes brought the painting to the attention of Duveen Brothers in a letter of 25 May 1918; he commented that he believed it to be by Pietro Cavallini and compared it to the Kahn painting (NGA 1949.7.1) that he had seen in New York. He said the painting at that time was actually with the Goya critic Aureliano de Beruete y Moret; Duveen Brothers Records, accession number 960015, Research Library, Getty Research Institute, Los Angeles: reel 212, box 357, folder 7; copies in NGA curatorial files. Generally (see Fern Rusk Shapley, Catalogue of the Italian Paintings, 2 vols., Washington, D.C., 1979: 1:96), first Carl Hamilton, and then Duveen Brothers, Inc., are cited as the owners of the painting, but this order needs to be reversed. It is well known that the majority of Hamilton’s paintings came from Duveen. According to Meryle Secrest (Duveen. A Life in Art, New York, 2004: 421, though she confuses the Kahn and Hamilton Madonnas, both with a provenance from Calahorra), Hamilton agreed to purchase NGA 1937.1.1 from Duveen Brothers (who had evidently offered the painting to him) in 1919. This is corroborated by the information on the provenance of the painting collected by Katherine Baetjer of the Metropolitan Museum of Art, New York, when the Duveen papers were held by that institution. She reports (in her letter to Jaroslav Folda of 16 September 1985; copy in the NGA curatorial files) that the Mellon Madonna “was purchased ... for the Paris branch of Duveen ... on 11 September 1919, as a work of Cavallino.” Duveen Brothers Records, accession number 960015, Research Library, Getty Research Institute, Los Angeles: reels 8–11, boxes 17–26 (New York Stock Books); reels 36 and 37, boxes 105–109 (Paris Stock Books); reel 422 (the X-book, 1910–1927). Berenson (1921) reported that the panel was in the Hamilton collection; evidently it was one of the paintings from Duveen Brothers with which “Hamilton was furnishing his [New York] city apartment....on credit” (see Edward Fowles, Memories of Duveen Brothers, London, 1976: 127-129). Indeed, Hamilton refers to the painting as in his possession when he writes to Joseph Duveen on 21 December 1921, enclosing Stephen Pichetto’s translation of Berenson 1921; Duveen Brothers Records, accession number 960015, Research Library, Getty Research Institute, Los Angeles: reel 161, box 306 (copy in NGA curatorial files). In 1921 Hamilton declared he was unable to pay for the paintings furnished to him on credit by Duveen Brothers, Inc., and returned them, at least in large part (Fowles 1976: 127-129). The panel continued to be cited in the literature for many years as belonging to Hamilton, but it must have been returned to the dealer at least by 1923, when it re-appeared in Duveen’s New York stock books (see the letter of Katherine Baetjer cited in note 2). It was during these years that the painting must have been subjected to a new restoration, the result of which is illustrated by the reproduction in Emilio Cecchi, Trecentisti senesi, Rome, 1928: 12. In the English edition of his study (Studies in Medieval Painting, New Haven, 1930: 4-16), Berenson described the panel as having previously belonged to the Hamilton collection. The original bill of sale is in Records of The A.W. Mellon Educational and Charitable Trust, Subject Files, Box 2, Gallery Archives, NGA; copy in NGA curatorial files. The provenance "from a convent in Calahorra, Spain" (see note 1) is given on the invoice. The Glory of Byzantium: Art and Culture of the Middle Byzantine Era A.D. 843-1261, The Metropolitan Museum of Art, New York, 1997, no. 262, repro. The Mother of God: Representations of the Virgin in Byzantine Art, Benaki Museum, Athens, 2000-2001, no. 68, repro. Byzantium: Faith and Power (1261-1557), The Metropolitan Museum of Art, New York, 2004, no. 286, repro. The reproductions that Berenson published in 1921 illustrate the painting in different states. The plate showing the whole image proves its damaged condition, with numerous small lacunae, especially along the edges. This was evidently the painting’s condition at the time it appeared on the Madrid art market in 1912. The detail with the bust of the Madonna and Child, however, documents the result of a subsequent treatment evidently conducted shortly before the publication. On this occasion the gold ground was renewed (leaving the halos without decoration), the faces were retouched, and the decoration on the back of the throne reconstructed. Possibly this was the restoration mentioned in the Duveen Brothers Records on January 3, 1920, according to the information collected in 1986 by Katherine Baetjer of the Metropolitan Museum of Art, New York, when the Duveen papers were held by that institution (cf. her letter to Jaroslav Folda of September 16, 1985; copy in NGA curatorial files). By the mid-1920s, by which time Carl Hamilton had returned the painting to Duveen Brothers (see Provenance, note 4), a decision had been made to subject it to a more thorough restoration; it was then that the painting acquired the appearance it still has. The second intervention must have been realized sometime before 1928, for in that year Emilio Cecchi reproduced it in its newly restored state. Berenson, Bernard. "Due dipinti del decimosecondo secolo venuti da Costantinopoli." Dedalo 2 (1921): 285-286, 287 (repro. ), 289, 290 (repro. ), 291 (repro. ), 292-304. Marle, Raimond van. La peinture Romaine au Moyen-Age. Strasbourg, 1921: 227-228, fig. 115. Marle, Raimond van. The Development of the Italian Schools of Painting. 19 vols. The Hague, 1923-1938: 1(1923):503-505, fig. 292. Mayer, August L. "Correspondence." Art in America 12 (1924): 234-235. Toesca, Pietro. Il Medioevo. 2 vols. Storia dell’arte italiana, 1. Turin, 1927: 2:1035 n. 39. Cecchi, Emilio. Trecentisti senesi. Rome, 1928: 12, 125, pl. 1. Berenson, Bernard. Studies in Medieval Painting. New Haven, 1930: 4-16, figs. 2-4. Byron, Robert, and David Talbot Rice. The Birth of Western Painting. London, 1930: 101 n. 1. Schweinfurth, Philipp. Geschichte der russischen Malerei im Mittelalter. The Hague, 1930: 377-379. Marle, Raimond van. Le scuole della pittura italiana. 2 vols. The Hague and Florence, 1932-1934: 1(1932):519, 522-523, 521 fig. 346. Lazarev, Viktor Nikitič. "Early Italo-Byzantine Painting in Sicily." The Burlington Magazine for Connoisseurs 63 (1933): 283-284, pl. 2a. Sandberg-Vavalà, Evelyn. L’iconografia della Madonna col Bambino nella pittura italiana del Dugento. Siena, 1934: 43 no. 115, pl. 26b. D’Ancona, Paolo. Les primitifs italiens du XIe au XIIIe siècle. Paris, 1935: 46-47, fig. 18. Comstock, Helen. "A Dugento Panel at the Toledo Museum." Connoisseur 98 (1936): 231. Lazarev, Viktor Nikitič. "New Light on the Problem of the Pisan School." The Burlington Magazine for Connoisseurs 68 (1936): 61-62. Lazarev, Viktor Nikitič. Istorija vizantijskoj živopisi: v druch tomach. Moscow, 1947-1948: 192, 351 n. 116. Rice, David Talbot. "Italian and Byzantine Painting in the Thirteenth Century." Apollo 31 (1940): 89-90, fig. 2. Duveen Brothers. Duveen Pictures in Public Collections of America. New York, 1941: no. 1, repro., as The Madonna and Child Enthroned by Constantinople School. National Gallery of Art. Book of Illustrations. Washington, 1941: 76 (repro. ), 233. Preliminary Catalogue of Paintings and Sculpture. National Gallery of Art, Washington, 1941: 31, no. 1, as Enthroned Madonna and Child. Richter, George Martin. "The New National Gallery in Washington." The Burlington Magazine for Connoisseurs 78 (June 1941): 177, pl. 2a. National Gallery of Art. Book of Illustrations. 2nd ed. Washington, 1942: no. 1, repro. 78, 239, as Enthroned Madonna and Child. Cairns, Huntington, and John Walker, eds. Masterpieces of Painting from the National Gallery of Art. New York, 1944: 14, color repro., as Enthroned Madonna and Child. Demus, Otto. The Mosaics of Norman Sicily. London, 1949: 363, 365 n. 27. Garrison, Edward B. Italian Romanesque Panel Painting: An Illustrated Index. Florence, 1949: repro. 48. Paintings and Sculpture from the Mellon Collection. National Gallery of Art, Washington, 1949 (reprinted 1953 and 1958): 3, repro., as Enthroned Madonna and Child. Comstock, Helen. "The Connoisseur in America." Connoisseur 126, no. 517 (1950): 52. Bettini, Sergio. "I mosaici dell’atrio di San Marco e il loro seguito." Arte veneta 8 (1954): 32, n. 6. Shorr, Dorothy C. The Christ Child in Devotional Images in Italy During the XIV Century. New York, 1954: 21, repro. 25. Felicetti-Liebenfels, Walter. Geschichte der byzantinischen Ikonenmalerei. Olten, 1956: 61, pl. 65. Demus, Otto. "Die Entstehung des Paläologenstils in der Malerei." In Berichte zum XI Internationalen Byzantinisten-Kongress. Munich, 1958: 16, 54-55. Demus, Otto. "Zwei Konstantinopler Marienikonen des 13. Jahrhunderts." Jahrbuch der Österreichischen Byzantinischen Gesellschaft 7 (1958): 87-104, fig. 2. Lazarev, Viktor Nikitič. "Constantinopoli e le scuole nazionali alla luce di nuove scoperte." Arte veneta 13-14 (1959-1960): 11-13, fig. 3. Shapley, Fern Rusk. Early Italian Painting in the National Gallery of Art. Washington, D.C., 1959 (Booklet Number Three in Ten Schools of Painting in the National Gallery of Art, Washington, D.C.): 12, color repro., as Enthroned Madonna and Child. The National Gallery of Art and Its Collections. Foreword by Perry B. Cott and notes by Otto Stelzer. National Gallery of Art, Washington (undated, 1960s): 6, as Madonna and Child Enthroned. Swoboda, Karl Maria. "In den Jahren 1950 bis 1961 erschienene Werke zur byzantinischen und weiteren ostchristlichen Kunst." Kunstgeschichtliche Anzeigen 5 (1961-1962): 148. Bologna, Ferdinando. La pittura italiana delle origini. Rome, 1962: 80-81. Walker, John. National Gallery of Art, Washington, D.C. New York, 1963 (reprinted 1964 in French, German, and Spanish): 297, repro., as Madonna and Child Enthroned. Pallucchini, Rodolfo, ed. La pittura veneziana del Trecento. Venice, 1964: 71-73. Calì, Maria. "L’arte in Puglia." Arte antica e moderna 15 (1965): 389. Summary Catalogue of European Paintings and Sculpture. National Gallery of Art, Washington, 1965: 21, as Enthroned Madonna and Child. Cairns, Huntington, and John Walker, eds. A Pageant of Painting from the National Gallery of Art. 2 vols. New York, 1966: 1:2-3, color repro. Stubblebine, James H. "Two Byzantine Madonnas from Calahorra, Spain." The Art Bulletin 48 (1966): 379-381, fig. 2. Lazarev, Viktor Nikitič. Storia della pittura bizantina. Turin, 1967: 318-319, 347 n. 177. European Paintings and Sculpture, Illustrations. National Gallery of Art, Washington, 1968: 14, repro., as Enthroned Madonna and Child. Rice, David Talbot. Byzantine Painting: The Last Phase. London, 1968: 55. Bologna, Ferdinando. I pittori alla corte angioina di Napoli, 1266-1414, e un riesame dell’arte nell’età fridericiana. Rome, 1969: 22, 247, 354. D’Elia, Pina, and Michele D’Elia, eds. Icone di Puglia. Catalogo della Mostra. Exh. cat. Pinacoteca provinciale. Bari, 1969: no. 33. Beckwith, John. Early Christian and Byzantine Art. The Pelican History of Art. Harmondsworth, Middlesex, 1970: 140, pl. 262. Demus, Otto. Byzantine Art and the West. New York, 1970: 216-218, 251 n. 147, figs. 238, 239. Hutter, Irmgard. Early Christian and Byzantine Art. New York, 1971: 156. Fredericksen, Burton B., and Federico Zeri. Census of Pre-Nineteenth Century Italian Paintings in North American Public Collections. Cambridge, Mass., 1972: 230, 311, 647. Finley, David Edward. A Standard of Excellence: Andrew W. Mellon Founds the National Gallery of Art at Washington. Washington, 1973: 40,  repro. European Paintings: An Illustrated Summary Catalogue. National Gallery of Art, Washington, 1975: 50, repro., as Enthroned Madonna and Child. Stoichita, Victor Ieronim. Ucenicia lui Duccio di Buoninsegna. Bucharest, 1976: 30-34, 149-150, fig. 21. Janson, Horst Waldemar. History of Art. 2nd ed. New York, 1977: 214, fig. 303. Shapley, Fern Rusk. Catalogue of the Italian Paintings. National Gallery of Art. 2 vols. Washington, 1979: 1:96-99; 2:pl. 65. Belting, Hans. "Introduzione." In Il medio oriente e l’occidente nell’arte del XIII secolo, Atti del XXIV congresso internazionale di storia dell’arte, September 10-18, 1979. Edited by Hans Belting. Bologna, 1982: 4-5, 9 n. 19, pl. 10. Belting, Hans. "The 'Byzantine' Madonnas: New Facts about Their Italian Origin and Some Observations on Duccio." Studies in the History of Art 12 (1982): 8ff, repro. Hoenigswald, Ann. "The 'Byzantine' Madonnas: Technical Investigation." Studies in the History of Art 12 (1982): 25-31, figs. 1 (ultraviolet light), 2 (X-radiograph), repro. Tambini, Anna. Pittura dall’Alto Medioevo al Tardogotico nel territorio di Faenza e Forlì. Faenza, 1982: 32-33. Boskovits, Miklós. A Critical and Historical Corpus of Florentine Painting. The Fourteenth Century. Sec. III, Vol. 9: The Miniaturist Tendency. Florence, 1984: 24 n. 60. Os, Hendrik W. van. Sienese Altarpieces 1215-1460. Form, Content, Function. 2 vols. Groningen, 1984-1990: 1(1984):23, 26, fig. 21. Walker, John. National Gallery of Art, Washington. Rev. ed. New York, 1984: 67, no. 2, color repro. Corrie, Rebecca W. "Tuscan Madonnas and Byzantine Masters." In Abstracts and Program Statements for Art History Sessions: Seventy-Third Annual Meeting, College Art Association of America, February 14-16, 1985. Los Angeles, 1985: 46. European Paintings: An Illustrated Catalogue. National Gallery of Art, Washington, 1985: 22, repro. Leone De Castris, Pierluigi. "Pittura del Duecento e del Trecento a Napoli e nel Meridione." In La Pittura in Italia. Il Duecento e il Trecento. Edited by Enrico Castelnuovo. 2 vols. Milan, 1986: 2:463, fig. 717. Folda, Jaroslav. "The Kahn and Mellon Madonnas: Icons or Altarpieces?" In Research Reports and Record of Activities, National Gallery of Art, Center for Advanced Study in the Visual Arts, 7 (1987): 57+. Wheeler, Marion, ed. His Face--Images of Christ in Art: Selections from the King James Version of the Bible. New York, 1988: 126, no. 23, color repro. Campagna Cicala, Francesca. "Messina. Scultura, pittura, miniatura e arti suntuarie." In Enciclopedia dell’arte medievale. Edited by Istituto della Enciclopedia italiana. 12 vols. Rome, 1991-2002: 8(1997):353. Leone De Castris, Pierluigi. “Sicilia: Pittura e miniatura.” In Enciclopedia dell’arte medievale. Edited by Istituto della Enciclopedia italiana. 12 vols. Rome, 1991-2002: 10(1999):619-620. Di Dario Guida, Maria Pia. Icone di Calabria e altre icone meridionali. 2nd ed. Messina, 1993: 115-116 (repros. ), 119, 121. Folda, Jaroslav. "The Kahn and Mellon Madonnas: Icon or Altarpiece?" In Byzantine East, Latin West. Art-Historical Studies in Honor of Kurt Weitzmann. Princeton, 1995: 501+, repro. Gombrich, Ernst. The Story of Art. 16th ed. London, 1995: 139, color fig. 88. Janson, Horst W., and Anthony F. Janson. History of art. 5th ed. New York, 1995: 241-242, fig. 345. Weyl Carr, Annemarie. "Byzantines and Italians on Cyprus: Images of Art." Dumbarton Oaks Papers 49 (1995): 352 n. 71. Corrie, Rebecca W. "The Perugia Triptych and the Transmission of Byzantine Maniera Greca." In Acts: XVIIIth International Congress of Byzantine Studies, vol. 3, Art History, Architecture, Music. Edited by Ihor Ševčenko, Gennady G. Litavrin and Walter K. Hanak. Moscow, 1996: 41, fig. 4. Gordon, Dillian. “Duccio (di Buoninsegna).” In The Dictionary of Art. Edited by Jane Turner. 34 vols. New York and London, 1996: 9:341. Schmidt, Victor M. "Die Funktionen der Tafelbilder mit der thronenden Madonna in der Malerei des Duecento." Mededelingen van het Nederlands Instituut te Rome 55 (1996): 60-63, fig. 16. Evans, Helen C., and William D. Wixom, eds. The Glory of Byzantium: Art and Culture of the Middle Byzantine Era, A.D. 843-1261. Exh. cat. Metropolitan Museum of Art. New York, 1997: 391, 396 (repro. ), 397. Gebhardt, Volker. Kunstgeschichte Malerei, 1997, no. 5, repro. Maginnis, Hayden B. J. Painting in the Age of Giotto: A Historical Reevaluation. University Park, PA, 1997: 77. Martin, Frank, and Gerhard Ruf. Die Glasmalereien von San Francesco in Assisi: Entstehung und Entwicklung einer Gattung in Italien. Regensburg, 1997: 70 n. 33, 72 n. 142. Bellosi, Luciano. Cimabue. Edited by Giovanna Ragionieri. 1st ed. Milan, 1998: 58-59, 62 n. 19, 63 n. 22. Lauria, Antonietta. "Una Madonna tardoduecentesca tra Roma e Assisi." in Arte d’Occidente: temi e metodi. Studi in onore di Angiola Maria Romanini. Edited by Antonio Cadei. 3 vols. Rome, 1999: 2:642. Polzer, Joseph. "Some Byzantine and Byzantinising Madonnas Painted During the Later Middle Ages, 1." Arte cristiana 87 (1999): 85. Polzer, Joseph. "Some Byzantine and Byzantinising Madonnas Painted During the Later Middle Ages, 2." Arte cristiana 87 (1999): 167-182, fig. 12. Velmans, Tania, Vojislav Korać, and Marica Šuput. Bisanzio: lo splendore dell’arte monumentale. Milan, 1999: 202. Kirsh, Andrea, and Rustin S. Levenson. Seeing Through Paintings: Physical Examination in Art Historical Studies. Materials and Meaning in the Fine Arts 1. New Haven, 2000: 179-181, fig. 187, 189. Labriola, Ada. "Lo stato degli studi su Cimabue e un libro recente." Arte cristiana 88 (2000): 343, 350 nn. 18-19. Vassilaki, Maria, ed. The Mother of God: Representations of the Virgin in Byzantine Art. Exh. cat. Benaki Museum, Athens. Milan and London, 2000: 438-439, 439 repro. Folda, Jaroslav. "Reflections on the Mellon Madonna as a Work of Crusader Art." In Dei gesta per Francos: Études sur les croisades dédiées à Jean Richard/Crusade Studies in Honour of Jean Richard. Edited by Michel Balad, Benjamin Kedar and Jonathan Riley-Smith. Aldershot, UK and Burlington, VT, 2001: 361-371. Folda, Jaroslav. "Icon to Altarpiece in the Frankish East: Images of the Virgin and Child Enthroned." In Italian Panel Painting of the Duecento and Trecento. Edited by Victor M. Schmidt. Studies in the History of Art 61 (2002): repro. 122, 131-135, 139, fig. 8. Polzer, Joseph. "The ‘Byzantine’ Kahn and Mellon Madonnas: Concerning their Chronology, Place of Origin, and Method of Analysis." Arte cristiana 90 (2002): 401-410, repro. 403. Evans, Helen C., ed. Byzantium: Faith and Power (1261-1557). Exh. cat. Metropolitan Museum of Art, New York. New Haven, 2004: 476-477, repro. Corrie, Rebecca W. "The Khan and Mellon Madonnas and their Place in the History of the Virgin and Child Enthroned." In Images of the Mother of God: Perceptions of the Theotokos in Byzantium. Edited by Maria Vassilaki. Aldershot, UK and Burlington, VT, 2005: 293-300, fig. 24.2. Folda, Jaroslav. Crusader Art in the Holy Land: From the Third Crusade to the Fall of Acre, 1187-1291. New York, 2005: 457-458, 557, fig. 300. Herbert, Lynley Anne. "Duccio di Buoninsegna: Icon of Painters, or Painter of “Icons"?." Ph.D. dissertation, University of Delaware, Newark, 2006: 4, 11. Folda, Jaroslav. Crusader Art: The Art of the Crusaders in the Holy Land, 1099-1291. Adershot, England, and Burlington, VT, 2008: 9, repro. 128, 130, 163 n. 28. Nelson, Robert S. "A Painting Becomes Canonical: Bernard Berenson, Royall Tyler, and the Mellon Madonna." In Renaissance Studies in Honor of Joseph Connors. Edited by Machtelt Israëls and Louis A. Waldman. 2 vols. Florence, 2013: 1:696-701, 969-970, fig. 1. Folda, Jaroslav, with a contribution by Lucy J. Wrapson. Byzantine Art and Italian Panel Painting: The Virgin and Child "Hodegetria" and the Art of Chrysography. Cambridge, England, 2015: 105, 122-131, 193, pl. 20, 323-329 notes. Boskovits, Miklós. Italian Paintings of the Thirteenth and Fourteenth Centuries. The Systematic Catalogue of the National Gallery of Art. Washington, 2016: 44-55, color repro. This type of throne, familiar since late antiquity, had a particular diffusion in Byzantine representations of the thirteenth century, and Rebecca Corrie (2000) conjectured that the motif might have had “imperial associations,” with reference to Solomon’s throne, whose top is described as “round behind” (1 Kings 10:19). Rebecca Corrie, in The Mother of God: Representations of the Virgin in Byzantine Art, ed. Maria Vassilaki (Milan and London, 2000), 438 – ​439. The throne could also allude to the role of Mary herself as sedes sapientiae, seat of wisdom, since she supports the Son of God on her lap. See Jaroslav Folda, “Icon to Altarpiece in the Frankish East: Images of the Virgin and Child Enthroned,” in Italian Panel Painting of the Duecento and Trecento, ed. Victor M. Schmidt, Studies in the History of Art (Washington, DC, and New Haven, 2002), 133 – ​134. On the throne in general, see Ilene H. Forsyth, The Throne of Wisdom: Wood Sculptures of the Madonna in Romanesque France (Princeton, 1972), 134 – ​203. On the iconography of the Hodegetria, cf. Gregor Martin Lechner, “Maria,” in Reallexikon zur byzantinischen Kunst, ed. Klaus Wessel, 7 vols. (Stuttgart, 2005), 6:59 – ​71. On the cult of the image, see also Christine Angelidi and Titos Papamastorakis, “The Veneration of the Virgin Hodegetria and the Hodegon Monastery,” in The Mother of God: The Representation of the Virgin in Byzantine Art, ed. Maria Vassilaki (Milan and London, 2000), 373 – ​387. Rebecca Corrie, in The Mother of God: Representations of the Virgin in Byzantine Art, ed. Maria Vassilaki (Milan and London, 2000), 438, emphasized the rarity of the motif of the brilliant red mantle in Marian representations in Italian medieval art. For the motif of the Christ Child holding a scroll, see Klaus Wessel, “Buchrolle,” in Reallexikon zur byzantinischen Kunst, ed. Klaus Wessel, 7 vols. (Stuttgart, 1966), 1:784 – ​795. Bernard Berenson, “Due dipinti del decimosecondo secolo venuti da Costantinopoli,” Dedalo 2 (1921): 284–304. Osvald Sirén, “A Picture by Pietro Cavallini,” The Burlington Magazine for Connoisseurs 32 (1918): 44 – ​47, attributed the Kahn Madonna alone to Pietro Cavallini. But since then only Raimond van Marle (1921, 1923, 1932) continued to support the hypothesis that the artist of the two paintings was Roman and associated with a cosmatesque workshop, though Walter Felicetti-­Liebenfels (1956) also admitted the possibility that the two panels might have been produced auf römischen Boden. Edward Garrison (1949), on the other hand, did not exclude the possibility that the paintings could have been Venetian in origin. See Raimond van Marle, La peinture romaine au Moyen-­Age (Strasbourg, 1921), 227 – ​228; Raimond van Marle, The Development of the Italian Schools of Painting, vol. 1, From the 6th until the End of the 13th Century (The Hague, 1923), 503 – ​505; Raimond van Marle, Le scuole della pittura italiana, vol. 1, Dal vi alla fine del XIII se­colo (The Hague, 1932), 519 – ​523; Walter Felicetti-­Liebenfels, Geschichte der byzantinischen Ikonenmalerei (Olten, Lausanne, 1956), 61; Edward B. Garrison, Italian Romanesque Panel Painting: An Illustrated Index (Florence, 1949), 44, 48. The Byzantine figurative culture of the two Madonnas is supported by Pietro Toesca, Il medioevo, 2 vols., Storia dell’arte italiana 1 (Turin, 1927), 2:1035 n. 39; Emilio Cecchi, Trecentisti senesi (Rome, 1928), 12, 125; Roger Fry, “Mr Berenson on Medieval Painting,” The Burlington Magazine for Connoisseurs 58, no. 338 (1931): 245; Evelyn Sandberg-­Vavalà, L’iconografia della Madonna col bambino nella pittura italiana del Dugento (Siena, 1934), 43 – ​44; Helen Comstock, “A Dugento Panel at the Toledo Museum,” Connoisseur 98 (1936): 231; Helen Comstock, “The Connoisseur in America,” Connoisseur 126, no. 517 (1950): 52 – ​53; Otto Demus, “Zwei Konstantinopler Marienikonen des 13. Jahrhunderts,” Jahrbuch der Österreichischen Byzantinischen Gesellschaft 7 (1958): 87 – ​104; Otto Demus, Byzantine Art and the West (New York, 1970), 216 – ​218, 251 n. 147; Karl Maria Swoboda, “In den Jahren 1950 bis 1961 erschienene Werke zur byzantini­schen und weiteren ostchrist­lichen Kunst,” Kunstgeschichtliche Anzeigen 5 (1961 – ​1962): 148; Irmgard Hutter, Early Christian and Byzantine Art (New York, 1971), 156; Horst Waldemar Janson, History of Art, 2nd ed. (New York, 1977), 214; Fern Rusk Shapley, Catalogue of the Italian Paintings, 2 vols. (Washington, DC, 1979), 1:96 – ​99; Jaroslav Folda, “The Kahn and Mellon Madonnas: Icons or Altarpieces?” Center / ​National Gallery of Art, Center for Advanced Study in the Visual Arts 7 (1987): 57 – ​58; Annemarie Weyl Carr, “Byzantines and Italians on Cyprus: Images of Art,” Dumbarton Oaks Papers 49 (1995): 352 n. 71. Subsequent to van Marle 1921, the great majority of art historians accepted this time span for the execution of the two paintings; only Duveen Pictures 1941 and NGA 1941 gave the date as early thirteenth century or, as in Demus 1958, as the first half of the century. John Walker (1963) reaffirmed the Berensonian date of c. 1200. See Raimond van Marle, La peinture romaine au Moyen-­Age (Strasbourg, 1921), 227 – ​228; Duveen Brothers, Duveen Pictures in Public Collections of America (New York, 1941), no. 1; National Gallery of Art, Preliminary Catalogue of Paintings and Sculpture (Washington, DC, 1941), 31; Otto Demus, “Zwei Konstantinopler Marienikonen des 13. Jahrhunderts,” Jahrbuch der Österreichischen Byzantinischen Gesellschaft 7 (1958): 87 – ​104; John Walker, National Gallery of Art, Washington, DC (New York, 1963), 64, 65, 297. George Martin Richter, “The New National Gallery in Washington,” The Burlington Magazine for Connoisseurs 78 (1941): 177, proposed the paternity of a “Byzantine master at the court of Norman Kings in Sicily in the twelfth century” for the Mellon Madonna. Viktor Nikitič Lazarev, “Early Italo-­Byzantine Painting in Sicily,” The Burlington Magazine for Connoisseurs 63 (1933): 283 – ​284; Viktor Nikitič Lazarev, Istorija vizantijskoj živopisi: V druch tomach (Moscow, 1947 – ​1948), 192, 351 n. 116; Viktor Nikitič Lazarev, “Constantinopoli e le scuole nazionali alla luce di nuove scoperte,” Arte veneta 13 – ​14 (1959 – ​1960): 11 – ​13; Viktor Nikitič Lazarev, Storia della pittura bizantina (Turin, 1967), 318 – ​319, 347 n. 177. The scholar’s proposal was accepted by Paolo D’Ancona, Les primitifs italiens du XIe au XIIIe siècle (Paris, 1935), 46 – ​47; David Talbot Rice, “Italian and Byzantine Painting in the Thirteenth Century,” Apollo 31 (1940): 89 – ​90; David Talbot Rice, Byzantine Painting: The Last Phase (London, 1968), 55; Ferdinando Bologna, La pittura italiana delle origini (Rome, 1962), 80 – ​81; Ferdinando Bologna, I pittori alla corte angioina di Napoli, 1266 – ​1414, e un riesame dell’arte nell’età fridericiana (Rome, 1969), 22, 247, 354; Rodolfo Pallucchini, ed., La pittura veneziana del Trecento (Venice, 1964), 71 – ​73; Maria Calì, “L’arte in Puglia,” Arte antica e moderna 15 (1965): 389; Pina D’Elia and Michele D’Elia, eds., Icone di Puglia: Catalogo della Mostra (Bari, 1969), no. 33; Victor Ieronim Stoichita, Ucenicia lui Duccio di Buoninsegna (Bucharest, 1976), 30 – ​34, 149 – ​150; Anna Tambini, Pittura dall’Alto Medioevo al Tardogotico nel territorio di Faenza e Forlì (Faenza, 1982), 32 – ​33; Pierluigi Leone De Castris, “Pittura del Duecento e del Trecento a Napoli e nel Meridione,” in La Pittura in Italia: Il Duecento e il Trecento, ed. Enrico Castelnuovo, 2 vols. (Milan, 1986), 2:463; Pierluigi Leone De Castris, “Sicilia: Pittura e miniatura,” in Enciclopedia dell’arte medievale, 12 vols. (Rome, 1999), 10:619 – ​620; Maria Pia Di Dario Guida, Icone di Calabria e altre icone meridionali, 2nd ed. (Messina, 1993), 119, 121; Francesca Campagna Cicala, “Messina: Scultura, pittura, miniatura e arti suntuarie,” in Enciclopedia dell’arte medievale, 12 vols. (Rome, 1997), 8:353; Tania Velmans, Vojislav Korać, and Marica Šuput, Bisanzio: Lo splendore dell’arte monumentale (Milan, 1999), 202. Only for the Mellon Madonna did Robert Byron and David Talbot Rice (1930) exclude the possibility that it might have been the work of a Byzantine artist, while Philip Schweinfurth (1930) and Hans Belting (1982 and 1990) rejected the hypothesis of Byzantine authorship for both paintings. See Robert Byron and David Talbot Rice, The Birth of Western Painting (London, 1930), 101 n. 1; Philipp Schweinfurth, Geschichte der russischen Malerei im Mittelalter (The Hague, 1930), 377 – ​379; Hans Belting, “Introduzione,” in Il medio oriente e l’occidente nell’arte del XIII secolo, Atti del XXIV congresso internazionale di storia dell’arte, September 10 – ​18, 1979, ed. Hans Belting (Bologna, 1982), 4 – ​5; Hans Belting, “The ‘Byzantine’ Madonnas: New Facts about Their Italian Origin and Some Observations on Duccio,” Studies in the History of Art 12 (1982): 7 – ​22; Hans Belting, Bild und Kult: Eine Geschichte des Bildes vor dem Zeitalter der Kunst (Munich, 1990), 33, 417, 420. Sergio Bettini (1954) proposed that the artist of both panels was a Florentine mosaicist who had been trained in a Byzantine milieu. Though he considered both panels to have been produced in Constantinople, James H. Stubblebine (1966) detected in them the influence of Duccio. Belting (“Introduzione,” 1982) first proposed that the two paintings were executed in Italy, under the influence of Cimabue and Duccio; later that year (“The ‘Byzantine’ Madonnas”) he conjectured that the Kahn Madonna probably had been executed in the area of Pisa, whereas the Mellon Madonna was the work of a local imitator. Hendrik W. van Os, Dillian Gordon, and Hayden B. J. Maginnis accepted this opinion. Joseph Polzer (1999 and 2002), on the basis of the incised decoration of the halos of the Kahn Madonna, which he thought was derived from the halo ornament of Tuscan paintings of the final decades of the thirteenth century, asserted that the two panels in the National Gallery of Art and some others stylistically akin to them were produced in Tuscany, probably in Siena, in the years 1280 – ​1320. The decorative repertoire published by Pasut 2003 identified the presence of the ornamental motif that Polzer had studied in various paintings executed in Tuscany, and also in other regions of Italy, in the third quarter of the thirteenth century, while Rebecca Corrie (2005) went further and identified its diffusion from Russia to Bulgaria and from Cyprus to Sicily, from the early years of the thirteenth century onwards. Sergio Bettini, “I mosaici dell’atrio di San Marco e il loro seguito,” Arte veneta 8 (1954): 32, n. 6; James H. Stubblebine, “Two Byzantine Madonnas from Calahorra, Spain,” The Art Bulletin 48 (1966): 379 – ​381; Hans Belting, “Introduzione,” in Il medio oriente e l’occidente nell’arte del XIII secolo, Atti del XXIV congresso internazionale di storia dell’arte, September 10 – ​18, 1979, ed. Hans Belting (Bologna, 1982), 4 – ​5; Hans Belting, “The ‘Byzantine’ Madonnas: New Facts about Their Italian Origin and Some Observations on Duccio,” Studies in the History of Art 12 (1982): 7 – ​22; Hendrik W. van Os, Sienese Altarpieces 1215 – ​1460: Form, Content, Function, vol. 1, 1215 – ​1344 (Groningen, 1984), 23, 26; Dillian Gordon, “Duccio di Buoninsegna,” in The Dictionary of Art, ed. Jane Turner, 34 vols. (New York, 1996), 9:341; Hayden B. J. Maginnis, Painting in the Age of Giotto: A Historical Reevaluation (University Park, PA, 1997), 77; Joseph Polzer, “Some Byzantine and Byzantinising Madonnas Painted during the Later Middle Ages, 1,” Arte cristiana 87 (1999): 85; Joseph Polzer, “Some Byzantine and Byzantinising Madonnas Painted during the Later Middle Ages, 2,” Arte cristiana 87 (1999): 167 – ​182; Joseph Polzer, “The ‘Byzantine’ Kahn and Mellon Madonnas: Concerning Their Chronology, Place of Origin, and Method of Analysis,” Arte cristiana 90 (2002): 401 – ​410; Francesca Pasut, A Critical and Historical Corpus of Florentine Painting: Supplementary Volume, vol. 2, Ornamental Painting in Italy (1250 – ​1310): An Illustrated Index, ed. Miklós Bosko­vits, new ed. (Florence, 2003), 125 n. 20; Rebecca W. Corrie, “The Kahn and Mellon Madonnas and Their Place in the History of the Virgin and Child Enthroned,” in Images of the Mother of God: Perceptions of the Theotokos in Byzantium, ed. Maria Vassilaki (Aldershot and Burlington, VT, 2005), 296. Hans Belting, “The ‘Byzantine’ Madonnas: New Facts about Their Italian Origin and Some Observations on Duccio,” Studies in the History of Art 12 (1982): 7, 21 n. 3, was the first to insinuate doubts about the provenance from Calahorra, indicating manuscript notes of E. B. Garrison, not otherwise specified, as his source for these doubts. Robin Cormack mentioned these notes, presumably found in the Garrison archive, now in the Courtauld Institute in London, during an apparently unpublished lecture given at Dumbarton Oaks in 1979. In essence, Belting claimed, “the dealer Weissberger had fabricated this provenance,” i.e., from Calahorra. What Belting asserted as a certainty is, however, it seems to me, no more than a suspicion, although often accepted by other scholars, e.g., Jaroslav Folda, “The Kahn and Mellon Madonnas: Icon or Altarpiece?” in Byzantine East, Latin West: Art-­Historical Studies in Honor of Kurt Weitzmann, ed. Doula Mouriki (Princeton, 1995), 503; Rebecca W. Corrie, “The Kahn and Mellon Madonnas and Their Place in the History of the Virgin and Child Enthroned,” in Images of the Mother of God: Perceptions of the Theotokos in Byzantium, ed. Maria Vassilaki (Aldershot and Burlington, VT, 2005), 293. Roger Fry, “Mr Berenson on Medieval Painting,” The Burlington Magazine for Connoisseurs 58, no. 338 (1931): 245: “The Carl Hamilton picture [Madonna and Child on a Curved Throne, in comparison with the Kahn Madonna] seems to be more Byzantine​ . . . ​particularly in the purely linear treatment of the throne." Belting’s later scholarship was published alongside a paper by Ann Hoenigswald (1982), who listed various disparities she observed in the respective techniques of the two paintings. In the Kahn Madonna, “the flesh tones seem to have been built upon an underlying green tone which provides the deepest shadows. This is not apparent​ . . . ​in the Mellon panel, where the shadow was mixed into the flesh tone.” Moreover, “the shadow formed by the folds of the blue robe on the Kahn Madonna is implied by the chrysography. . . . In the Mellon panel, however, there is a two-toned system of a lighter and darker blue juxtaposed with gold outline.” According to Hoenigswald, therefore, the “comparisons of technique​ . . . ​are strong indications that the panels were not the work of the same artist.” Hans Belting, “Introduzione,” in Il medio oriente e l’occidente nell’arte del XIII secolo, Atti del XXIV congresso internazionale di storia dell’arte, September 10 – ​18, 1979, ed. Hans Belting (Bologna, 1982), 4 – ​5; Hans Belting, “The ‘Byzantine’ Madonnas: New Facts about Their Italian Origin and Some Observations on Duccio,” Studies in the History of Art 12 (1982): 7 – ​22; Ann Hoenigswald, “The ‘Byzantine’ Madonnas: Technical Investigation,” Studies in the History of Art 12 (1982): 27, 28, 29. We do not have at our disposal sufficient data to determine whether, and to what degree, the technique of a painter of this period could alter in the course of years or decades. Though observing differences between the chrysography of the Kahn Madonna and the Mellon Madonna (in which he detected an “etwas kühlen Klassizismus” [a somewhat cool classicism], 91), Otto Demus justly emphasized that both were characterized by a “Formverständnis” (understanding of form, 93) absent from contemporary Italian paintings. Otto Demus, “Zwei Konstantinopler Marienikonen des 13. Jahrhunderts,” Jahrbuch der Österreichischen Byzantinischen Gesellschaft 7 (1958): 90 – ​91, 93 – ​94. See Otto Demus, “Zwei Konstantinopler Marienikonen des 13. Jahrhunderts,” Jahrbuch der Österreichischen Byzantinischen Gesellschaft 7 (1958): 95 – ​97. 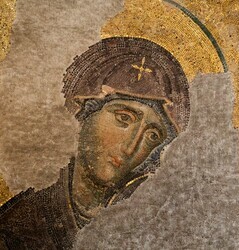 Viktor Nikitič Lazarev, Storia della pittura bizantina (Turin, 1967), 198, and others suggested a date in the twelfth century, but a dating shortly after 1261 is now more prevalent, e.g., Robin Cormack, “The Mother of God in the Mosaics of Hagia Sophia at Constantinople,” in The Mother of God: The Representation of the Virgin in Byzantine Art, ed. Maria Vassilaki (Milan and London, 2000), 118 – ​119; Tania Velmans, “La pittura bizantina: Mosaici, affreschi, icone, miniature,” in Bisanzio, Costantinopoli, Istanbul, ed. Tania Velmans (Milan, 2008), 182. “Selbst wenn die Deesis der Hagia Sophia das einzige erhaltene Konstantinopler Werk dieser Epoche wäre” — ​​rightly observed Demus — ​​“müsste die Konfrontation mit ihr genügen, um den hauptstädtischen Ursprung der Kahn- wie der Mellon-­Madonna zweifelsfrei darzutun” (Even if the Deesis of Hagia Sophia were the only surviving Constantinopolitan work of the period, a comparison with the Kahn and Mellon Madonnas would be enough to unequivocally confirm their origins in the capital). Otto Demus, “Zwei Konstantinopler Marienikonen des 13. Jahrhunderts,” Jahrbuch der Österreichischen Byzantinischen Gesellschaft 7 (1958): 97. However, the same scholar listed some other similar works, including the frescoes in the Saint Demetrios Cathedral in Vladimir, Russia (1194 – ​1199), in which he saw the work of both Constantinopolitan masters and their Russian disciples as a kind of anticipation of some aspects of the art developed in the first decades of the thirteenth century. 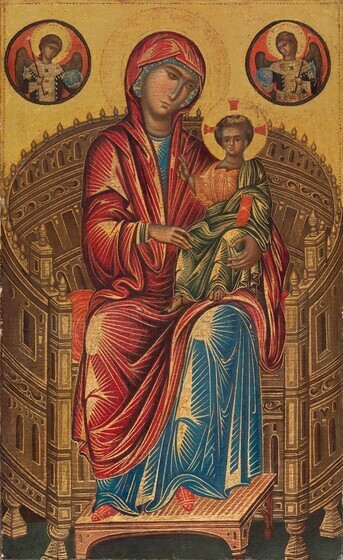 For his part, Hans Belting (1982) cited the Madonna of the Hilandar monastery on Mount Athos and some other later icons dating to the fourteenth century, though it is fair to say that these reveal a stylistic phase a good deal more advanced than the panels in the National Gallery of Art; Hans Belting, “The ‘Byzantine’ Madonnas: New Facts about Their Italian Origin and Some Observations on Duccio,” Studies in the History of Art 12 (1982): 10 – ​11. Jaroslav Folda (1995) proposed that “the Mellon Madonna master must have seen a Byzantine example such as that in Paris, Bibl. Nat. ms. gr. 54” and thus used as his model the miniatures of an evangelistary; Jaroslav Folda, “The Kahn and Mellon Madonnas: Icon or Altarpiece?” in Byzantine East, Latin West: Art-­Historical Studies in Honor of Kurt Weitzmann, ed. Doula Mouriki (Princeton, 1995), 504. But, in his view, the image in the Gallery especially had close affinities with some Crusader panel paintings in Cyprus (Madonna and Child and Saint Nicholas with some scenes from his life, both in the Byzantine Museum at Nicosia). For other analogous paintings and miniatures, see Rebecca W. Corrie, “The Kahn and Mellon Madonnas and Their Place in the History of the Virgin and Child Enthroned,” in Images of the Mother of God: Perceptions of the Theotokos in Byzantium, ed. Maria Vassilaki (Aldershot and Burlington, VT, 2005), 293 – ​303. The present writer finds significant affinities between the two Washington panels and some icons preserved in the monastery of Saint Catherine on Mount Sinai. These paintings are of uncertain provenance, but they can be assumed to have been executed in the second half of the thirteenth century and in Constantinople, to judge from their very sustained quality of execution and accomplished pictorial technique: I refer in particular to the Archangel Michael, the Arch­angel Gabriel, and a half-length Madonna in Prayer. See, respectively, Konstantinos A. Manafis, ed., Sinai: Treasures of the Monastery of Saint Catherine (Athens, 1990), 170, pl. 41; Helen C. Evans, ed., Byzantium: Faith and Power (1261 – ​1557) (New Haven, 2004), 384 – ​385, no. 240; Jaroslav Folda, Crusader Art in the Holy Land: From the Third Crusade to the Fall of Acre, 1187 – ​1291 (Cambridge, 2005), 222, fig. 126. See Francesca Pasut, A Critical and Historical Corpus of Florentine Painting: Supplementary Volume, vol. 2, Ornamental Painting in Italy (1250 – ​1310): An Illustrated Index, ed. Miklós Boskovits, new ed. (Florence, 2003), 125 n. 20; Rebecca W. Corrie, “The Kahn and Mellon Madonnas and Their Place in the History of the Virgin and Child Enthroned,” in Images of the Mother of God: Perceptions of the Theotokos in Byzantium, ed. Maria Vassilaki (Aldershot and Burlington, VT, 2005), 293 – ​303. Viktor Nikitič Lazarev, “New Light on the Problem of the Pisan School,” The Burlington Magazine for Connoisseurs 68 (1936): 61 – ​73, followed by Otto Demus, “Zwei Konstantinopler Marienikonen des 13. Jahrhunderts,” Jahrbuch der Österreichischen Byzantinischen Gesellschaft 7 (1958): 93, placed the Kahn and Mellon Madonnas in relation with the Madonna and Child Enthroned, no. 240 in the Pushkin Museum in Moscow, which he considered the work of a Pisan master. In my view, the painting in Moscow is a precious and rare example of Venetian painting of the third quarter of the thirteenth century, which, like the later but still thirteenth-century two-sided panel in the monastery of Santa Maria at Zadar, exemplifies knowledge and diffusion of this genre in the Venetian and Adriatic regions. See Miklós Boskovits, A Critical and Historical Corpus of Florentine Painting, sec. 1, vol. 1, The Origins of Florentine Painting, 1100 – ​1270 (Florence, 1993), 134 n. 284; Miklós Boskovits, Andrei Bliznukov, and Rodolfo Maffeis, “Studi recenti sulla pittura italiana in Russia: Il nuovo catalogo del Museo Puškin,” Arte cristiana 92 (2004): 113 – ​114; and Helen C. Evans, ed., Byzantium: Faith and Power (1261 – ​1557) (New Haven, 2004), 497 – ​498. A throne of very effective perspective rendering and of similar type also appears in the large panel in the basilica of San Nicola at Bari; it, too, sometimes is compared with the two paintings in the National Gallery of Art. See Pina D’Elia and Michele D’Elia, eds., Icone di Puglia: Catalogo della Mostra (Bari, 1969), no. 33. 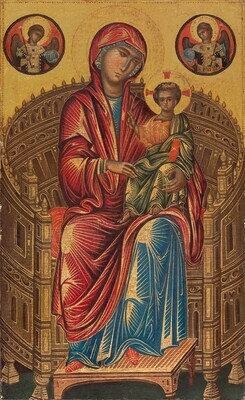 The Bari icon, which to judge from its style ought to be the work of a master of Byzantine formation, again dating to the thirteenth century, is the forerunner of a type of Marian image that would become very widespread in southern Italy, as shown for instance by the Madonna usually attributed to Montano d’Arezzo in the Sanctuary of Montevergine near Avellino; Ferdinando Bologna, I pittori alla corte angioina di Napoli, 1266 – ​1414, e un riesame dell’arte nell’età fridericiana (Rome, 1969), 102 – ​107. On the thrones of the Kahn and Mellon Madonnas, see the analogies quoted by Rebecca W. Corrie, “The Kahn and Mellon Madonnas and Their Place in the History of the Virgin and Child Enthroned,” in Images of the Mother of God: Perceptions of the Theotokos in Byzantium, ed. Maria Vassilaki (Aldershot and Burlington, VT, 2005), 296. The NGA scientific research department analyzed a sample of the wood, using optical microscopy, and found it to be linden (report dated December 26, 1985, NGA conservation files). Cross-sections of the gilded area and the painted area were analyzed using light microscopy and scanning electron microscopy to compare the preparatory layers. A layer of glue was found beneath the gilded areas, which is unusual and further indicates that the gold has been replaced. The NGA scientific research department performed the analysis (report dated January 6, 2006, NGA conservation files). Ann Hoenigswald, “The ‘Byzantine’ Madonnas: Technical Investigation,” Studies in the History of Art 12 (1982): 28.